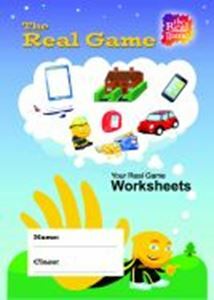 These pads contain one copy of each student worksheet featured in The Real Game. They have been printed in full colour and bound in a pad, for use one per pupil, to save you time and effort. This gives you colourful, inexpensive student worksheets without the hassle. Can only be purchased by those in possession of a current Real Game Site Licence or the new Real Game Printed Version. Sold in Packs of 10, 24 pages in each pad.